Three Twisted Tales – Available NOW! My very FIRST book for kids! – “Three Twisted Tales” is out NOW! Three Twisted Tales surround a jolly ice-cream man with a money-grabbing wife, a mysterious elderly woman who may just be a witch and a deaf King who’s constantly harassed by his loud-mouthed Queen. These humorous rhyming stories with a macabre twist are aimed at 7 to 12 year olds. 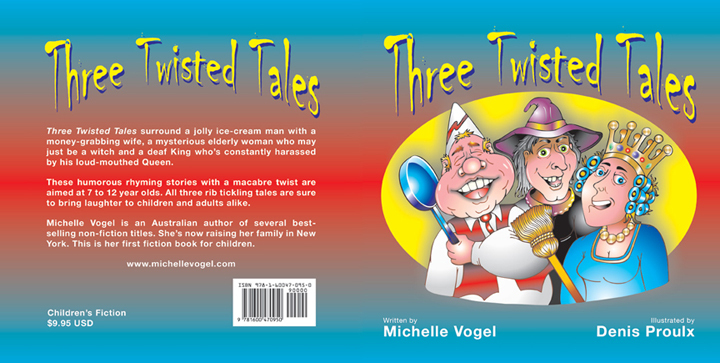 All three rib tickling tales are sure to bring laughter to children and adults alike.